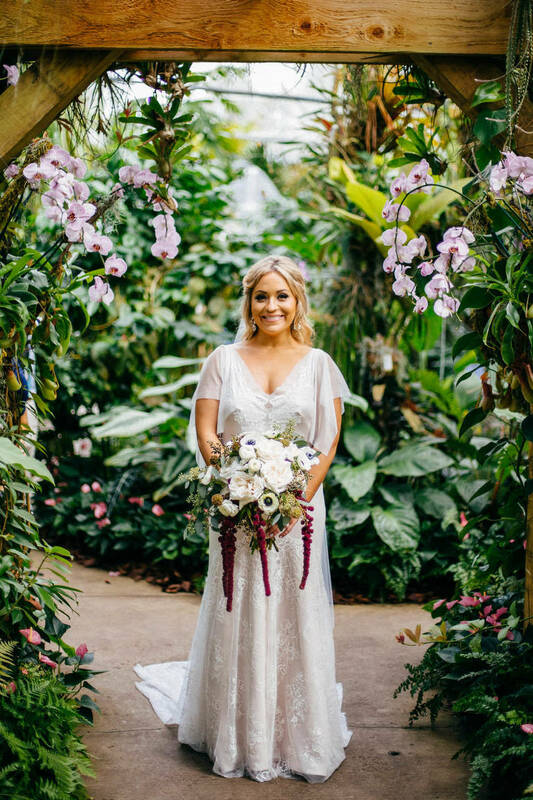 Nayda and Alex’s luxurious destination Sarasota wedding came to life with outdoor botanical surroundings, hanging chandeliers, and signature cocktails named after the bride and groom’s two adorable pups. With a color palette of oxblood, navy blue, and blush pink, the whimsical outdoor celebration exuded romantic elegance and charm. 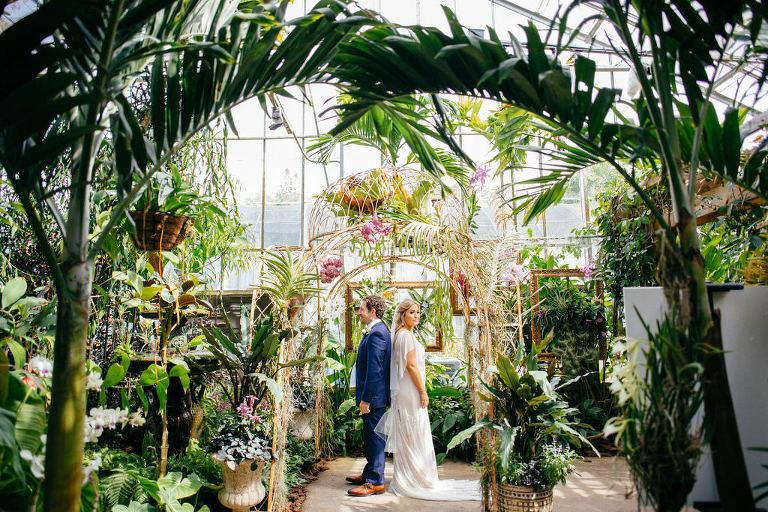 The Michigan bride and groom searched for a Sarasota wedding planner with an eye for planning upscale outdoor affairs and who knew how to help destination couples. 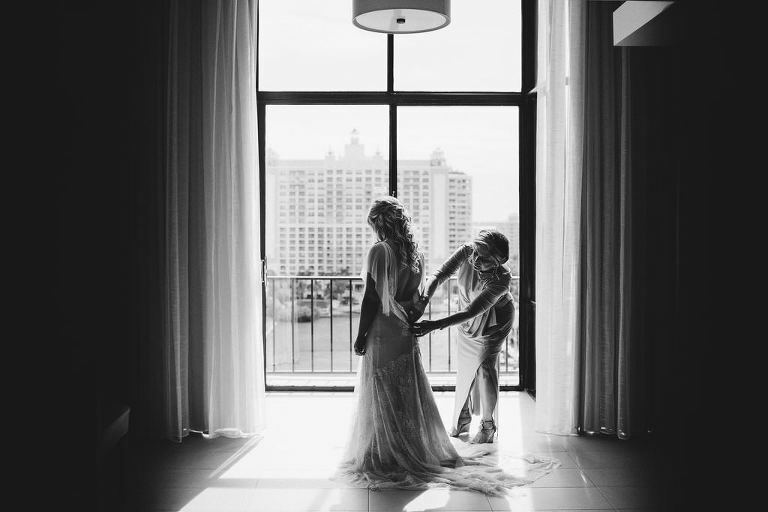 Looking back, the couple reminisced on their first look and intimate ceremony moments. The proposal completely caught me off-guard. I had just finished sitting for the Michigan Bar exam two days prior and was both distracted and exhausted. We had planned to take a vacation to Harbor Springs, Michigan to celebrate my being finished with studying and the test. The first night there, we went to a lovely dinner on the water. During the meal, we talked about how much Harbor Springs meant to us in our relationship. We had taken many trips there as a couple and had shared many memories, including where Alex first taught me to ski, and stories about him growing up there as a little boy with his family. After dinner, Alex asked if I wanted to walk to the end of the pier. When we got there, Alex got down on one knee, said a bunch of sweet things, and asked me to marry him. Before I could even process what was going on, or say yes, he had slipped the ring on my finger. People around us began applauding, and then I noticed a photographer out of the corner of my eye. Alex hired her to capture the proposal so that we could always remember it and share it with our families since they weren’t there. As soon as my hands stopped shaking and my teeth stopped shattering, I FaceTimed my parents. After that, we raced back to our rented house on Lake Michigan, popped champagne, watched the sunset on the beach, called more family and friends with the news, and smiled our faces off. It was positively perfect! What was your wedding theme/inspiration? The venue helped dictate our exact vision for the wedding. We were inspired by the dramatic banyan trees and excited that the lush gardens themselves provided much of what we needed in terms of décor. I envisioned a romantic vibe with hanging chandeliers, light and airy fabrics, and lots of greenery and flowers cascading down the chuppah. While planning our special day we made sure to incorporate the grounds themselves and not foreshadow their natural beauty. 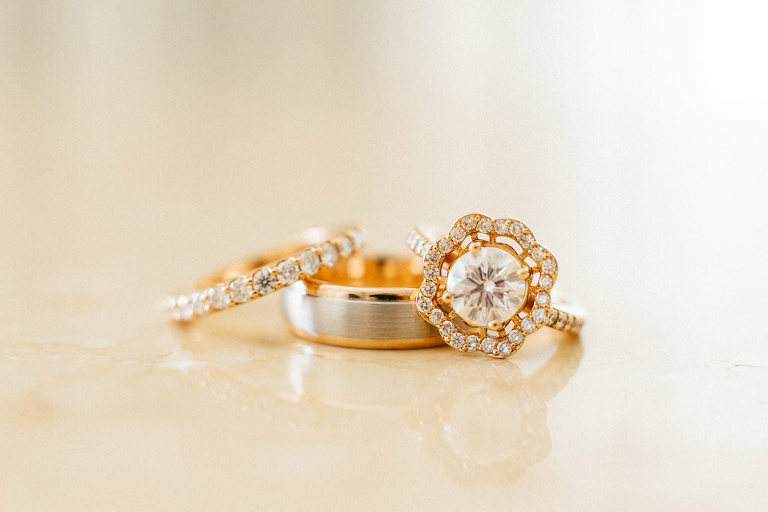 Our initial color inspiration was my engagement ring which Alex designed himself. Set in rose gold, we thought it would be the perfect accent color. I actually went to Home Depot and grabbed a few dozen paint swatches and played around with different combinations until we found one that worked. Our colors ended up being oxblood, navy, and blush pink with rose gold and cream accents. With both of us working a lot and attempting to plan a wedding out-of-state, we knew we needed a full-service wedding planner. We both had a lot of opinions about what we wanted for our day, but we didn’t have the time to do endless sourcing online. We wanted to hire an experienced planner who was easy to communicate with, attentive and ready to understood capture the look we envisioned. We definitely got all of that with NK Productions. Picking our planner was a one-and-done task. I searched online for the best wedding planners in Sarasota and came across NK Productions. I immediately reached out to Nicole, had a phone consult, and instantly felt at ease and confident after our conversation. NK Productions was attentive throughout the entire process, had great suggestions for vendors, and tried their best to keep us relatively on budget. Our wedding day run so smoothly, and we couldn’t have done it without the help of Nicole and her team. Enjoy the planning process! Though it can be overwhelming at times, being engaged and planning a day to celebrate your love is the best part. Alex and I made a point to set-aside fun by planning dates together, whether it was a Saturday morning designing our website at our favorite coffee shop or a Thursday night doing seating arrangements at a local wine bar. This made the process feel less like an obligation and more like fun time together! At some point during the day, take time just for the two of you to reflect and take it all in. For us, this was immediately after the ceremony while our guests enjoyed cocktail hour. We got whisked away in golf carts to a private space with drinks and appetizers so that we could refuel and soak in the enormity of having just become husband and wife. Because the day goes by so quickly, it’s important to take tiny snapshots in your mind throughout the day. I would pretend that my eyes were a camera and took pictures in my head so that I could remember special moments and create core memories. Similarly, a couple of days after the wedding, we both wrote down our favorite memories from the day so that we can reference them many years from now when the memories aren’t as vivid. Have some semblance of an after-party. We opted for something informal back at the hotel bar, but I am so glad we did! It’s not every day that you get all of your best friends in the same place at the same time. The wedding itself does not provide enough time to enjoy the company and laughs with all of your favorite people, so milk the night for all that it’s worth and create a time and space to continue the celebration afterward.